There are instances when a person feels like his or her life is worthless and will never get better. This is a common example of hopelessness and can often occur when individuals seem to be feeling discouraged, depressed, or anxious about a sudden event. In case of a patient suffering from spinal cord injury, he or she may feel hopeless in response to having permanent paralysis. Hopelessness can result when someone is going through difficult times or unpleasant experiences. A person may feel overwhelmed, trapped, or insecure, or may have a lot of self-doubts due to multiple stresses and losses. He or she might think that challenges are unconquerable or that there are no solutions to the problems and may not be able to mobilize the energy needed to act in his or her own behalf. Patient living in social isolation, who lacks social support system and resources, may also experience hopelessness. Other factors include poverty, being homeless, those with limited access to health care, and loss of belief in God’s care or loss of trust in prior spiritual beliefs. Patient expresses the will to live. Patient verbalizes feelings and participates in care. Patient displays positive future orientation. Patient maintains suitable appetite for age and physical health. Patient mobilizes energy in own behalf. Patient makes decisions related to his or her care. Patient sets goals consistent with optimism, meaning in life, and belief in self and others. Patient demonstrates reframing skills when viewing aspects of life that appear negative. Assessment is needed in order to recognize possible difficulties and events that may have lead to Hopelessness. Assess physical appearances such as the grooming, posture, and hygiene. Patients who are experiencing hopelessness may not have the urge to participate in self-care activities. Ascertain the role that illness presents in the patient’s hopelessness. Patient’s current situation may affect his or her physical functioning. Cancer often makes patients’ perception to extremes. Assess the patient’s understanding of the situation, belief in self, and his or her own abilities. Patients may consider the peril is greater than their resources to manage it. Assess the patient for and point out reasons for living. Interventions that build the awareness of reasons for living may lower feelings of hopelessness and reduce suicidal thoughts. Assess patient’s willingness to eat, sleeping patterns, and daily activities. Alterations from these regular patterns are apparent during hopelessness. Patients may have decreased appetite and poor activity level. Patients may sleep more or experience insomnia. Learn whether the patient perceives unachieved outcomes as failures or emphasizes failures instead of accomplishments. Feelings of hopelessness might develop when the patient sees failure as the end result of every effort he or she makes. Evaluate the patient’s ability to establish goals, make decisions, and solve problems. Patients who are hopeless often think he or she is unable to meet established goals and incompetent to make any decisions and solve problems. Identify previous coping strategies and their effectiveness. Successful coping is determined by past experiences. Take time to listen to verbalization of hopelessness, suicidal thoughts, and lack of self-worth. Suicidal ideation and behaviors are usually present in patients experiencing hopelessness. Determine the patient’s social support system and possible source of hope. Patients in social isolation find it hard to improve their condition. Assessment and evaluation of support group may render the assistance the patient needs at this time. Ascertain the patient’s expectations for the future. Dependence on others for help and treatments and uncertainty about events can add to a feeling of hopelessness. Encourage a positive mental perspective, discourage negative thoughts, and brace patient for negative results. Accurate information is generally favored by families; surprise information concerning a shift in status may cause the family to worry that information is being withheld from them. Provide openings for the patient to verbalize feelings of hopelessness. The nurse promites a supportive environment by taking time to listen to the patient in a nonjudgemental way. Manage to have consistency in staff appointed to care for the patient. This approach establishes trust, reduces the patient’s feeling of isolation, and may promote coping and restore hope. Assist patient with looking at options and establishing goals that are relevant to him or her. Mutual goal setting guarantees that goals are achievable and helps to restore a cognitive-temporal sense of hope. Encourage the patient to recognize his or her own strengths and abilities. Promoting awareness can facilitate the use of these strengths. Work with the patient to set small, attainable goals. Mutual goal setting guarantees that goals are achievable and helps to restore a cognitive-temporal sense of hope. Render physical care that the patient is unable to achieve and respect patient’s abilities. This approach overcomes weakness, guilt, and other negative perceptions. Stay and spend time with the patient. Use empathy; try to understand what the patient is saying, and communicate this understanding to the patient. These approaches can inspire hope. Experiencing warmth, empathy, genuineness, and unconditional positive regard can greatly reduce feelings of hopelessness. Assist the patient in establishing realistic goals by recognizing short-term goals and revising them as needed. Supervising the patient little by little makes the problem more manageable. Setting realistic goals is important so as not to be frustrated with the chance of not to accomplish them. Help the patient in developing a realistic appraisal of the situation. Patients may not be aware of all the available resources and support groups that can help them move through this stressful life situation. Acknowledge acceptance of expression of feelings. Active listening may help patients express themselves. Promote an attitude of realistic hope. Stressing the patient’s intrinsic worth and seeing the immediate problem as manageable in time may provide support. Giving unrealistic hopes will not help the patient and might worsen the situation. Send feelings of acceptance and understanding. Avoid false reassurances. An honest relationship facilitates problem-solving. False reassurances are never helpful to patients. Provide time for patient to initiate interactions. Patients who have feelings of hopelessness require special moment to initiate relationships and sometimes are not able to. Strengthen patient’s relationship with significant others; allow them to take part in patient’s care. Enhancing a sense of connectedness fosters hope. Concern from others may help change the patient’s focus from self. Encourage family and significant others to display care, hope, and love for patient. Encouraging the family to present patient support, to understand patient’s feelings, and to be physically present and involved in care are approaches that allow the family to change patient’s hope state. Practice touch, if appropriate and with authority, to show care, and encourage the family to do the same. This approach provides comfort and is necessary for the development of hope. Present opportunities for the patient to manage care setting. 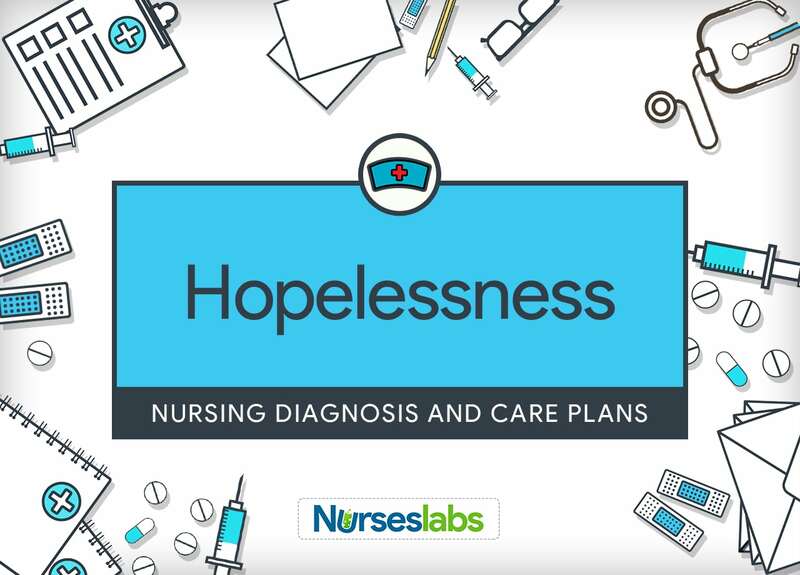 When a hopeless patient is given opportunities to make choices, his or her perception of hopelessness may be reduced. Promote the use of spiritual resources as desired. Religious practices may provide strength and inspiration. Provide plant or pet therapy if possible. Taking care of pets or plants promotes redefining patient’s identity and makes him or her feel needed and loved. Refer patient to self-help groups such as I Can Cope and Make Today Count. These groups enable the patient to acknowledge the love and care of others, and they foster sense of belonging.